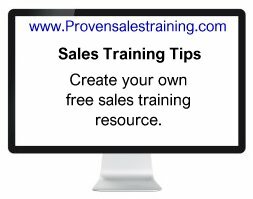 Sales training tips on how to create a free resource that will give you or your team techniques on selling and self-motivation. Easily set up this free training resource. Do it as a team activity. Use it for learning sales skills and self-motivation. When the results start to show you take all the credit for creating this valuable team training resource. It only takes one person in an organisation to start this technique rolling and others soon join in, will it be you that takes the credit for it..? Create a resource that will be used to increase sales skills. This sales team training resource works great for both small businesses and large organisations. And you could start it today with one easy action that you’ll see later. I've worked in sales for over 25 years, as a salesman, a trainer and coach, and as a manager. The sales training tips I'm about to share with you will quickly build you a free training tool that can be used by the entire sales department. Everyone can get involved and when the success is seen by others you will get the credit for starting this action. What if you had a free resource, built up over time, that was accessible by all and topics were easy to find? Have you clicked around the Internet and found websites, like the one you're reading now, with free sales training, and motivation techniques. There is lots of free information available online but people don't use it because it takes time to search for it, or their saved favourites are not very well organised. But what if you collected and organised all the good, free, resources that you come across online and saved them in an accessible and ordered place for you and everyone else to use. Quick training on specific parts of the selling process. Bursts of self-motivation techniques when needed. Team meeting discussions and training. Preparation for activity such as cold calling sessions. Changing sales pitches to make them more effective. You can quickly build a free team training resource by collecting links to great websites on sales training tips, and motivation techniques, in a shared folder for use by you or your team. I started my first sales training tips library by placing links to my favourite websites in a shared folder accessible by my team. The links had titles to say what the topic was and similar topics were grouped together on separate pages of a word workbook. There are now many better ways of setting up shared folders that are searchable without too much technical knowledge, but this was back in the last century and the Internet was only just starting to be used for more than word processing and sending emails. In a team meeting I shared the idea and we started accessing and using the links. If you're like me, when you start an action like this you get a great feeling of satisfaction when it's successful. For me what showed that this library of sales training tips was successful was when the team added their own links to great content that they had found. Soon this one small action, that had started with a few links to useful team training resources on a simple word workbook, had grown into a shared library that was regularly being contributed to by the team. It had now become a team activity, which was motivational and team building, and it saved me time preparing team meetings and quick training sessions. Another great benefit was that it cost nothing. A few moments of people's time but no financial costs. No budget approval, no waiting for it to be signed off. And great feedback from my superiors. You can now take that first action today by putting the links I've given you below into a shared folder where all team members, even those working remotely, can gain access. Take your first action today and start your sales training tips free resource library with the links below. We've had pages suggested to us by ImprovEDU, a community organization dedicated to improving access to educational resources for lifelong learners. ImprovEDU is a volunteer-staffed organization with individuals in the USA, UK, and Australia. They serve young people helping to curate and organize educational materials available online, and they have also started to serve the broader community by committing to help lifelong learners in the same way. They have suggested to us some great pages that they use on the topic of team building.